This is the actual drawing which got me the gig on "Alice". At the time I did it, I wasn't even aware what movie and director it was for. A couple of illustrators had been requested by Sony to participate in a pitch, and it turned out that Bobby Chiu, Kei Acedera and myself were hand picked by Tim Burton after Sony showed him the drawings. awesome! (about being hand picked) I haven't seen the movie yet, but it's on my list of things to do. I like the depth in this drawing, how the background is out of focus. The tree stump he is sitting on looks real, do you ever collage or paint over real pictures in your drawings? Amazing, I can't believe how detailed it is! If you don't mind me asking, what program did you use? I'm looking forward to see more pics (not necessarily Alice-related) from you. hey, I saw Alice yesterday and I ran into your article looking for info. Just wanna say I loved the characters and your work in general! Greetings from the argentinian Patagonia! What program did u use? Amazing work! 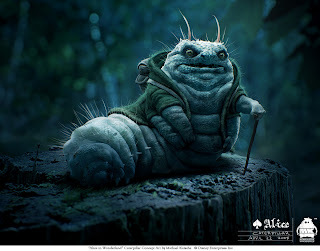 I love the caterpillar and how detailed he is. And the colouring is incredible, too. Very reminiscent of those ultra-detailed microscopic photographs you'd see of insects in science magazines. I can see you use potos and drawings together. SO inspiring and great to get me thinking in other directions. Love your work and will visit back to this blog regularly! I remember this one from your presentation yesterday at Nucleus. Great work, and great talk! Hey man - been a fan of your work for awhile. Great paintings! Another congrats from me too! Hello Michael Kutsche saw his work in cgsociety.org and found very good congratulations I am Brazilian and of course artistic design. Congratulations again and good fruit. Amazing design. It has a more sinister appearance than the final version, but his huge grin gives him a sense of whimsy.